Hello Again Fab Free’rs! I’m always glad you’re here. So I kind of don’t want to admit it, but this sweater by Oubliette suits me so well. *laughs* Not that I don’t get excited, but I’m rarely one to get super outwardly excited. So I could be totally thrilled about something and not express it the way most would expect. This sweater is one of 2 group gifts I picked up today, the second being a 300 linden gift card at Go&See which I used to get this skin for free. In addition I also picked up these earrings by SynCo for free at Winter’s Hollow. Keep reading and I’ll let you know all the info you need about each of these fabulous finds! The Sweater – Sometimes you just need a little cheekiness in your wardrobe, or at least I do. This sweater is a current group gift at Oubliette. The Petite Mort/Oubliette group is currently free to join, so don’t miss out! Also, there’s an equally fun, if slightly more sinister Krampus sweater waiting over at Petite Mort that you can pick up for free with the same group tag. These novelty sweaters come in several mesh sizes. In addition I want to mention that gift cards are 50% off for a limited time! The Skin/Gift Card – Right now the Go&See group is just 50 linden to join, and there is a limited time group gift 300 Linden gift card available until December 25th. The group gift card vendor is at the Go&See main store, right next to the redelivery terminal. That said, you could either wear your gift card and add the balance to your store credit then save it for later, or do like I did and pick up 3 of the group only 99 linden promo skins for free. There is a row of group promo 99 linden skins at Go&See. The one Pru is wearing is December’s promo named Eva. Next to the vendor for Eva there are specific instructions posted on how to get the skin for 99 linden, and how to purchase using your store credit. Follow the instructions carefully. You will need to be wearing the Go&See group tag! Eva comes in a Genus Project head applier, with Maitreya and Omega body appliers. 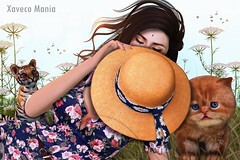 Other promo skins come in Catwa appliers, and or Omega appliers. Please be sure to try the free demos before you purchase! Additionally, there are male skins at Go&See. The Earrings – These tapered studs are a free gift by SynCo at Winter’s Hollow. There is no group needed, just pay the gift box under the Christmas tree 1 linden and be instantly refunded 1 linden. This gift includes a color/texture change hud that will let you choose from preset metallic color choices for 3 parts of the earrings. Also, the same hud will allow you to resize them. I would definitely consider these claw-like studs to be unisex. Winter’s Hollow is open until December 31st. Categories: appliers, events, Free, gift certificates, group gifts, groups, jewelry, mesh, other, Piercings, shirt, skins, unisex | Tags: Belleza Freya, Belleza Isis, Belleza Venus, Buzzeri, Buzzeri Eyes, cheapies, fab free, Fab Free in SL, fabfree, fabfree in sl, fabulously free in SL, Foxcity, FOXCITY Poses, free, free gift, Free Gift at Winter's Hollow, Free Gifts in SL, free group gift, free group join, free in sl, freebies, Genus, Genus Project, Genus Project head, Go&See, Go&See Group Gift, Go&See Promo, Go&See Skin, Group Gift Gift Card, Group Gift Sweater, limited offer, Maitreya Lara, Oubliette, Oubliette Group Gift, Oubliette Sweater, Prudence Rexroth, RunAway Hair, Second Life, second life fashion, Second Life Freebies, sl, Slink Hourglass, Slink Physique, SynCo, SynCo Winter's Hollow Gift, Winter's Hollow, Winter's Hollow GIft | Permalink.